In this version we've added 2 new shapes: Wedge and Corner. We've also made it easier to import Minecraft and MagicaVoxel Vox files. Open the Edit Tool window (menu View > Edit Tool). For the wedge, choose the axis orientation, x y or z. Additional axis inversions mirror the wedge along the chosen axes. For the corner, pick the corner point which will be the summit of the 3 sided pyramid. The corners coordinates are normalised xyz. Tip: enable the Anchor to visualise the axes. Move your cursor into the world. You should see a green 3D grid. 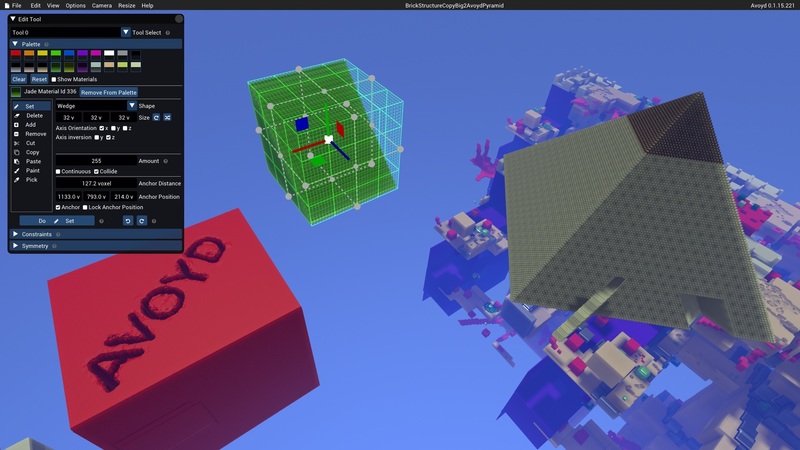 For Magica Voxel, browse to the Vox file you want to load (*.vox extension) and select it. Minecraft maps are loaded with the default Minecraft palette. It'll be listed in the Materials tool (menu View > Materials) where you can edit it. MagicaVoxel Vox files are imported together with their own palette, available in the Materials tool (menu View > Materials) once the Vox file is loaded. It is not possible to export Avoyd files back to Minecraft nor MagicaVoxel Vox format. Changes have to be saved in the Avoyd format. Please log in or create an account to post an answer.